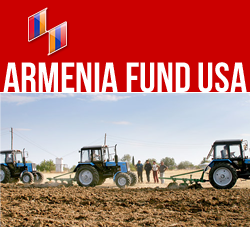 NEW YORK, New York — In keeping with its tradition of providing vital support to educational institutions throughout Armenia’s regions, the Armenia Fund’s Great Britain affiliate implemented its latest assistance project this month, just as classes resume for the fall. During August 24-26, Mrs. Anahid Ghazarian, a representative of the Great Britain affiliate, delivered school supplies to three educational institutions: the Children’s Art School in the city of Talin, Aragatsotn Region and the community schools of the villages of Artsni and Dzoramut in the Lori Region. Worth approximately $7,000 USD, the in-demand supplies will benefit a total of 180 students. In the past decade, the school-assistance program of the Fund’s Great Britain affiliate, chaired by Ms. Armineh Carapeti, has benefited more than 1,800 students in the regions of Shirak, Lori, Tavush, Vayots Dzor, and Aragatsotn. This month, as Mrs. Ghazarian delivered the donated school supplies, she was met with community celebrations at each of the campuses she visited. “In addition to sponsoring major infrastructure projects in Armenia, the Armenia Fund’s Great Britain affiliate is proud to continue implementing school-assistance projects in various regions of the Republic,” Mrs. Ghazarian said during one of her speeches. “As the new academic year approaches, I hope that initiatives such as these will help ease the financial burden that parents face simply to send their children to school.” At the ceremony in Dzoramut, Mrs. Aghavni Chapanyan, a mother of three schoolchildren, mentioned sadly that often students in her community avoid attending school because they lack the most essential of school supplies. “Even the slightest bit of assistance provided to the residents of these remote communities is of great importance to them and goes a long way,” said Mariam Zenjirjyan, who oversees the program of support to educational institutions across Armenia’s regions.